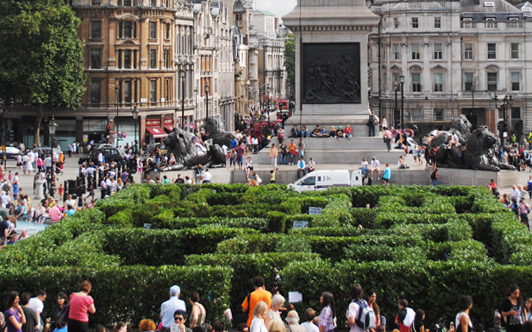 Trafalgar Square has been transformed with a temporary hedge maze which takes visitors through a potted history of some of the streets of London’s West End. The maze, created by the West End Marketing Alliance, is full of fascinating facts – did you know, for example, that the area we now know as Covent Garden was originally known, during Saxon times, as Convent Garden? Or that the Beatles last ever gig was performed on a rooftop in Savile Row? The maze is only in Trafalgar Square for this week, so get in quick if you want to visit (and pick up a free badge for your effort in conquering the maze). When Exploring London visited, waiting time was only about 10 minutes. For more, see www.WestEndLondon.com.